With a firm commitment to quality, we are involved in offering a wide ambit of Dropping Funnel. 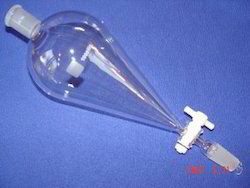 Aimed at prosper growth in our domain, we are instrumental in manufacturing an excellent quality Stopcock Dropping Funnel. - AARK International provides dropping funnel cylindrical with glass key stopcock & I/C stopper exporter in India, made from precision borosilicate 3.3. available at best price. A. T.k. pattern with grooved glass grip stopper and spout. Capacity :- 15, 30, 60, 125 ml. B. 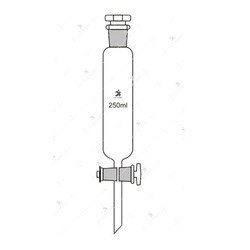 Glass bottle with rubber teat, dropping pipette ground in the neck. Capacity: - 30, 60, 125 ml.